One of the main difficulties of designing truly sustainable solutions is the complexity of scope and domain that need to be taken into account. Projects often focus on one or at most a few subject areas, such as energy, waste, or materials. It is rare for a project to be developed that aims to be sustainable in a truly integrated sense. The usual way of mapping the different impact areas is done in the “People, Planet, Profit” profile, also called the triple bottom line, or triple P (PPP). 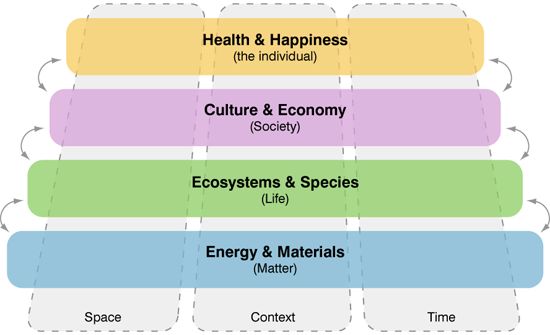 While this is inspirational and useful in a communcation context, it’s not an adequate system to fully evaluate the spectrum of sustainability. PPP misses aspects, lacks hierarchy and the “profit” aspect is highly debated, often replaced by “Prosperity”. While these are noble attempts to improve on the PPP framework, structurally ELSIA brovides a much more coherent framework for evaluation and categorisation. Using PPP as a structure framework for indicator development or spetrum definition will undoubtedly lead to undesired externalizations. The ELSIA system helps map the larger set of relationships between the project at hand and the ways in which it will influence the world around it. This system can be used for management and policy issues as well as design problems. It is essentially a tool for “systems thinking” that functions by systematically allowing the user to map relationships between objects. It can be used for indicator selection, effect mapping and many other stages of systems analysis. The categories of ELSIA are functionally nested within each other. 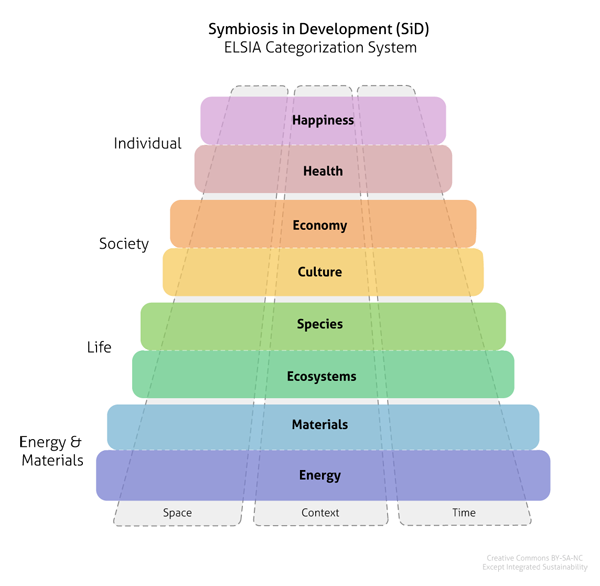 All materials are made from energy, and all ecosystems are made of materials. The economy is a subset of culture, just as each individual is always a part of society, and so on. Using the SiD stack and the ELSIA relationship system one can prevent developing systems that improve specific domains, but externalize issues to other key areas. ELSIA can be represented in various ways. Below you can see the SiD ELSIA4 Stack. We only use ELSIA4 as a communication tool. For all assessment, we use ELSIA8 (further below). 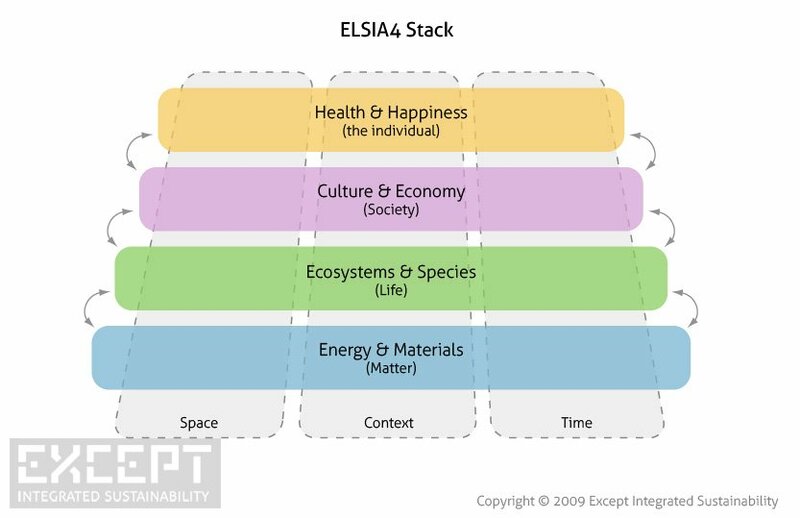 The ELSIA stack is effective at communicating the causal relationship between the different categories, with the moat goal oriented (happiness) at the top, and the most fundamental requirement at the bottom (energy), with the necessary bridging categories in between. The ELSIA relationship system and SiD Stack are part of the Symbiosis in Development (SiD) sustainability methodology.